A recent poll, conducted by Texas-based legal defense group U.S. Law Shield has found that an overwhelming number of poll takers prefer that drivers for the popular ride-sharing app Uber be able to be armed when behind the wheel. By more than a 4:1 margin, members of U.S. Law Shield responded in the online survey that they will not support Uber because of its carry policy. The survey was attached to a story that U.S. Law Shield posted about a Florida Uber driver named Namique Anderson, who would likely lose his driving gig for violating Uber’s “no guns” policy after a life or death situation in which Anderson defended himself and his passenger against a man pointing guns at them. Below is the public reaction to the ruling and the choices that many folks are making to say that this is the last straw for Uber. About 76%, or 283 of 374 respondents, said they will not use Uber as a result of its carry policy. 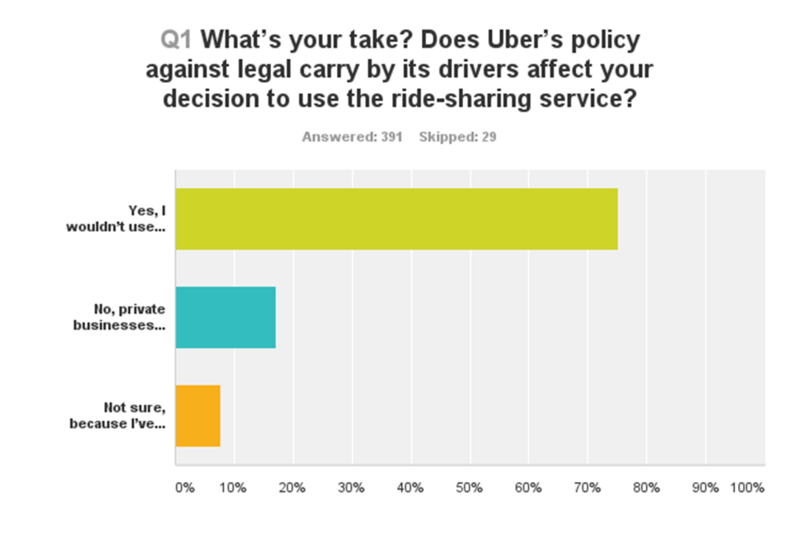 While roughly 17% said the carry policy won’t affect their decision to use Uber, and another 7% said they weren’t sure because they had not used Uber. This is a huge margin who disagree with Uber's policy regarding firearms. So what do you all think? Do you use Uber? Does this affect your choice to ride with them if you do? Let us know in the comments below. If that is the policy that UBER is choosing I could not use their service if I wanted to. I carry daily therefore I couldn’t. As a driver where the the ones out here put our lives at risk. To make millions a day why can’t we protect ourselves , if something was to happen to us uber isn’t gonna take care of our kids /family so why not.